Law-enforcement officials across the nation are taking extraordinary new precautions against a growing threat to their ranks: fentanyl, a drug so toxic that just a few grains can kill. Kevin Phillips, a deputy sheriff in Harford County, Md., recently felt the drug’s wrath when he responded to an increasingly routine call of drug overdose, opening a nightstand in the home while searching for heroin. “About two or three seconds after I shut it, my face started burning. I broke out in a sweat,” said Cpl. Phillips, who was rushed to the hospital for treatment after overdosing on fentanyl that had been mixed into the heroin. Authorities swiftly set a new policy: deputy sheriffs must treat drug seizures like an active shooter incident—to slow down and evaluate the scene—in this case ensuring they have elbow-length gloves, protective masks and safety glasses. Law-enforcement encounters with fentanyl nationwide rose to more than 14,000 in 2015 from about 1,000 in 2013, according to federal data. Fentanyl, which is 50 times more powerful than heroin, has been used legally for decades, including as a painkiller for cancer patients. But in the past five years, illegal forms of the drug, often produced in China and Mexico, have quickly spread throughout the country and contributed to a broader opioid epidemic that has killed tens of thousands of people. Two to three milligrams of fentanyl—the equivalent of five to seven grains of table salt—is enough to cause respiratory depression, cardiac arrest or death, according to the U.S. Drug Enforcement Administration, which issued new guidelines for first responders in June. Overdosing can occur from inhaling or touching fentanyl, which drug dealers often mix with heroin because it is cheaper and has a higher potency. It’s not just humans at risk. While executing a narcotics search warrant in October, officers from Broward County Sheriff’s Office in Florida directed three trained dogs—Primus, Finn and Packer—to sniff around a house. The dogs soon because drowsy, found it difficult to stand and eventually adopted blank stares and became unable to move, said Det. Andy Weiman, the head dog trainer. 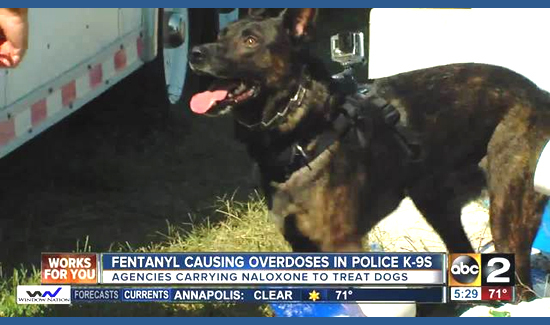 The dogs were later determined to have overdosed in a house where fentanyl was found. They were treated at an animal hospital and were back at work the next day, he said. Law-enforcement officials are quickly overhauling their procedures for handling fentanyl and other forms of the drug. About a year ago, New York Police Department detectives routinely tested narcotics at a crime scene. Now, they wear protective gloves to package the drugs and drive it to a Queens laboratory to be tested. There, workers with white safety suits, respirator masks and the antidote naloxone stand by as an analyst tests the drug, which lies within a glass tank. NYPD officials estimate they will find fentanyl in more than 2,200 narcotics cases by the end of the year, up from nine cases in 2013, said Deputy Chief Emanuel Katranakis, head of the force’s forensic investigations division. The NYPD recently began urging officers to request backup from specially trained units wearing safety gear if they suspect heroin is present. The Philadelphia Police Department is requiring officers to take a class on safety precautions for fentanyl and arming all officers with naloxone. In May, police officers in East Liverpool, Ohio, stopped a car because they suspected the occupants were selling drugs. When the officers approached, wearing gloves and masks, the car’s occupants dispersed a white powder so the officers wouldn’t find it. “They smashed it into the floor, into a pop can, anywhere they could hide it,” said Brian Allen, the city’s director of public safety and service. Later back at the police station, one of the officers, Chris Green, brushed powder off the back of his shirt and quickly became faint and collapsed. He was rushed to the emergency room, where testing showed it contained fentanyl. Officer Green recovered.